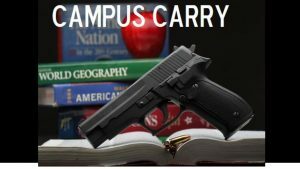 State law does not ban concealed-carry on campus unless it is an athletic event, in fact Title 21 of Wyoming state statutes and the Wyoming Constitution limit education administrators from making any such ban. Wyoming Statute 6-8-104 (t) "No permit issued pursuant to this section or any permit issued from any other state shall authorize any person to carry a concealed firearm into- Any college or university facility without the written consent of the security service of the college or university" Also prohibited 6-8-104(vi) Any school, college or professional athletic event not related to firearms. Contact your legislators so we can change this "consent clause" and force Wyoming college institutions to allow the lawful carry of firearms on campus. Below are responses to requests to concealed-carry with a permit on campus grounds throughout Wyoming, the students names have been withheld to protect them from any recourse by the institutions. All of these requests were from female students. Firearms are not allowed on campus. This is covered under state statute. I am the only person who can grant exception to this, and do not do so. I have received your communication regarding your ability to carry a concealed weapon on campus. Assuming you intended your email as a request, your request is denied. Wyoming law and UW Regulations prohibit this activity. I urge you to review UW Reg 178 3(g) (ix) which you will find at http://www.uwyo.edu/generalcounsel/. Under the provisions of UW Reg. 178, you are required to have written consent to carry a concealed weapon on campus. The University's approach is to decline permission absent a reason based on safety. Failure to comply with the Regulation will subject you to sanctions including student discipline, a prohibition from being on campus and sanctions under Wyoming law. I'm very sorry that I must refuse your request to carry concealed on LCCC as I cannot see a need for your carrying a weapon here and If you feel for any reason that my decision is unjust you can contact the Vice President of Students who is Dr Cook and his phone number is 778-1217. Your request to carry a weapon on Casper College property is denied. You may call Casper College Campus Security for assistance any time you are on campus by dialing (307) 268-2688. Campus Security Officers are not law enforcement officers and are not armed. Unfortunately WWCC weapons policy states that approval to possess firearms on campus by non-law enforcement must be approved by President Karla Leach. I however do make recommendations on these issues but I cannot recommend approval of your request. However I will forward this to Dr. Leach for her final approval. I am curious if there is a particular reason you do not feel safe on our campus? President Prestwich forwarded you message onto me. I appreciate your position on this issue, and thank you for following protocol by requesting permission to carry on campus. I have been asked several times in the past, and I have always declined all requests. First off, not that I don’t think something could happen at NWC, but NWC is a very safe place. Secondly, as a Police Officer that would be the first to respond to any incident here on campus, I don’t want to have to try and decipher if you were just protecting yourself, or if you were the one carrying out the violent act. Should you have any further questions, please respond to this email, or feel free to call me at 307-754-6067. With regards to your request, I must inform you that EWC does not allow individuals to carry a concealed firearm on campus. Thank you for your adherence to the Wyoming statute addressing this issue. I am equally concerned for your safety while you are on our campus. I am however denying your request as I do not feel the need to grant it. If you feel unsafe or have reason to believe you are in danger please stop by my office at any time to discuss the circumstances associated with your feelings. Thank you.